Make life easier when moving goods into your storage unit. Loading and unloading of the trailer is the responsibility of the customer and we ask that goods are secured while in transport to protect both the goods and the vehicle from damage. Bookings for the trailer may be made with the staff during office hours. Trailer Hire – The Eagle Self Storage Covered Trailer is also available for hire to current Eagle Eye Self Storage customers. This may be used outside of office hoursand is available at a daily and half daily rate. Bookings for the trailer hire may be made with staff during office hours. The trailer’s internal dimensions are 2.4m long by 1.5m wide by 1.8m high. Customers will require a suitably sized vehicle with a tow bar to tow the trailer. 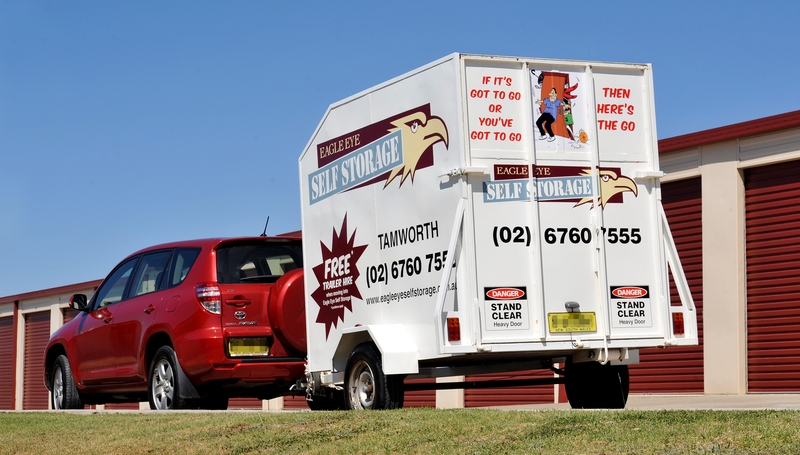 Move-in Truck, Van or Ute - At Eagle Eye Self Storage, we realise that your time is valuable and often not having to fit in with set timeframes for use of a truck makes your life easier. Each customer is limited to one credit claim per Standard Self Storage Agreement and only within the first calendar month from your agreement start date. Credit Values will be the lesser amount of either the receipt for truck, van or ute hire; or as determined by your unit size. To claim your credit, please present your paid hire receipt to staff in the office. Conditions apply so please speak with staff for more information.